We got breakfast and were arriving into port just about the time we were done eating. The port is very industrial with nothing at all to see or do. 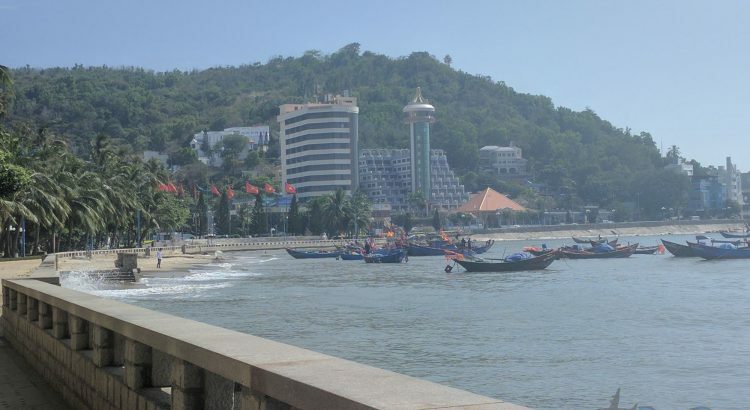 We booked a last minute shore excursion through the cruise line to the resort town of Vung Tau. There are iPads you can use to book tours that no one seemed to ever use rather than waiting in the huge line. That being said, there were not many options given the last minute change of schedule. There was also a free shuttle to the town of Ba Ria, but not having done any research, we decided on the tour. We were on our way for our tour of Vung Tau shortly after docking. It was about a 45 minute drive to the resort town on the ocean. The first stop was at the whale temple which was a Buddhist temple to protect sailors and fishermen. After that, we stopped for a photo of the largest statue of Jesus in SE Asia. It was similar to Corcovado in Rio with the statue with outstretched arms on top of the mountain. Lunch was a buffet at a beautiful resort on the ocean. The spread was great, complete with old Vietnamese women forcing people to try the exotic foods and fruits by piling it on your plate. I guess grandmas forcing food on people extends beyond borders and cultures. There were both western and local Vietnamese options available. I had some local dishes and very interesting fruits that you don’t see back home. After a bit of free time to explore the resort, we were off again for a quick stop at the front beach and fisherman village. We then drove to the town of Ba Ria for a stop at a Taoist temple. There was a local Vietnamese kid who decided he was going to try to pretend to be on our tour. Next we went to the local market. That was definitely a full sensory experience. They sell everything at the market from clothes to electronics to vegetables to raw meat. We did not buy anything, but had a great time just walking around seeing everything that was available. Our next few stops were at local family businesses. The first was a rice wine distillery which included a free sample. Second was at a rice paper making home where it is still done by hand. You could definitely tell the woman had been doing it for quite a while. Every piece of rice paper came out perfect and the same size. The last stop was at an orchard where we received a sample of fruit and coconut milk. It really was a great tour, possibly the best of the cruise. We got to see a wide variety of sights and local culture. I was impressed with Princess’ ability to provide what felt like a local experience with a somewhat large tour group. We got back on the ship and had just enough time to get ready for dinner. We went to complete the lyric trivia where we did pretty well all things considered. Then it was off to dinner. The show that evening was a short production show of songs by famous song writers and peformers – Cher, Barbara Striesand, etc. It was fairly short, but well done.